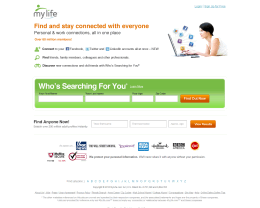 MyLife.com offers one of the largest people search & social network search engines online. With MyLife you can search over 750 million user profiles to find old friends, classmates and lost loves. New users can build a network with friends or just search for someone they are missing. It is free to set up a MyLife profile, but in order to communicate with others, you must upgrade your account to "paid". You pay for nothing here. You can get more accurate info using Google. When you join there are higher fees for anything you want to do. Constant charges. Zero stars! Time waster and a scam. Got an email- send a message! Write the message, push send. To send one must pay. To receive, one must pay. Got my little hopes up to contact my mom after twenty years. Ha on me, but at least I didn't pay them to jerk me around. Crooks!!! And sadly they can get by with it. Anyone eldw would be in prison by now for what they are doing. I signed up for the free search. Their website is confusing and before you know it they will take $83 out of your account because they have gotten you to think that you will get an "advanced search" for that price for a little more. Well, it is NOT a "little " more. I am a single mom with a disabled daughter. Knew family may be looking for me. Desperate to find out. Money is tight for me. I called to cancel and get my money back. Was told by email they will reimburse in 7 business days to my debit card. 2 wks later---nothing Have called that 888 number they provide for contact.. It is a "talk to someone if you are lonely etc---want to meet someone #!!! Now they may have my info and robbed me as well. Does anyone know the ceo's name, ? Will definitly be calling the Fed Trade Commision. They defiitly duped us because they play on or desperation and foolish impulsive nature. MyLife.com is soooo stupid. They are lying scam artist that snoop around facebook and myspace and steals the information of so many innocent people.And they lie about MyLife.com being free!! You guys can go to jail for that!!! I'd have given minus stars if I could have. Forget these search sites. I tried one a year ago,only to find most information outdated, plus everytime they send you someplace else, it is another blank for credit card number. Luckily, I used a limited card, because after unsubscribing after $30.00, they grabbed the few dollars left on the card. You can do it alone. I left this family 50 years ago while in the military, and after writing churches, service stations, realestate places, BBB, newspapers, Facebook; and many, many more places, I found them. We are now writing and phoning after 50 years. Yes folks, you can do it on your own. All it takes is patience and persistance. Those search sites advertise help, but what you really get is 'bait and switch'. Good luck, and as I said, "YOU CAN DO IT YOURSELF." Tried to find a couple of relatives - NOT FREE at all - what a joke. Don't waste your time. I very savy guy but they cond me wish I COULD GET HOLD OF THE GITS for takin a brit like that! You have to give them one star on here or they won't post this blog. But for real they should get 0 to -3 on their proformance rating. I don't believe in getting even, but mylife.com makes me want to find the @hole owner and take all that he has. Then tie him and his cronnies down by an ant hill, then pour honey all over them. People, am i wrong for thinking like that?? PEOPLE I JUST WROTE A BLAZING TESTIMONY TO THE SLUGS THAT RUN AND MANAGE MYLIFE.COM. IT DOGED THEM JUST LIKE THE DOGS THAT THEY ARE. DOE'S ANYONE OUT THERE KNOWS WHAT A CON ARTIST OR A GRIFTER IS ?? WELL, THEY GOT ME AND EVERYONE ELSE ON THIS REVIEW. OUR GOVERNMENT IS SUPPOSED TO PROTECT AND PROSCUTE THIEVES SUCH AS THESE, BUT MYLIFE IS STILL HERE AND ADVERTISING ON TV TO SUCKER IN MORE HARD WORKING PEOPLE. OUR PROTECTORS ONCE AGAIN HAVE DROPPED THE BALL AND LEFT THE AMERICAN PUBLIC WITH OUR PANTS DOWN AT OUR ANKLES AND MYLIFE RAMMING US FROM BEHIND. 70 of 125 people found this review helpful. This site is the epitome of "Bait and Switch". Don't waste your time, nor money. Go to Zabasearch.com as it is truly free. Again, forget My Life and don't leave your personal info. 64 of 111 people found this review helpful. I can honestly say this site is absolutly a SCAM....its not FREE and they will never get a dime from me. 68 of 114 people found this review helpful. I gave them one star because I couldn't select anything less. My Mom tried to sign up with Mylife and thinking she was only paying for a month they charged her for 12 months = 144.00$. I have been on her account and I couldn't tell you how Mylife.com is any different then Facebook. Infact Facebook blows this scummy site out of the water. I have never benefited from using this week website and nore will anybody else. Facebook is free and you can pull just as much info from it then <Myshitlife.com. They will never be half as succesful as facebook, I will never use there site again and I'm going to make it a point to let everyone know how their service is and how not to use them. I am also a personal friend of Get Reggie from king 5 news in seattle wa and if these clowns don't refund ever cent for my Mom he has already committed to do 3 minutes on air time to expose this site and all there wrong doings. DO NOT SUBSCRIBE TO MYLIFE.COM THEY WILL TAKE YOUR MONEY AND PROVIDE OUT DATED INFORMATION THAT WILL BE COMPLETELY UNUSABLY!! False advertising! They say they're free but won't show you results unless you sign up and pay. 42 of 68 people found this review helpful. If you want to know how to get in touch with someone, it will cost you. I don't mind the cost, but that isn't free as it states. One has to put in all sorts of personal info before it tells you the cost for a free search. This is not free. 39 of 55 people found this review helpful. I fell for them not once but twice! I thought I would do the month thing one more time because the first time I wasn't using the site after signing on. Now they have all my personal info and when I try to read msg's or look at another page they want to charge me again. This site needs to be taken down. And yes, they will bill you without your knowledge. Ha, I used of those prepaid Visa's and they will get no more money from me! 52 of 81 people found this review helpful. 34 of 53 people found this review helpful. Horrid Website. Dishonest practices. They try to get you to give you more personal information and your credit card to remove your information. They promise not to charge your credit card -- and if you fall for that like my elderly neighbor did they charge your credit card repeatedly. 25 of 36 people found this review helpful. Be detailed and specific. Try to tell people what you would have wanted to know before you used the service. O stars not available to choose! They published user info I gave looking for my elderly and possibly deceased aunt AND info I put on Facebook. Hell I couldn't even find my relative through court records. Not like I'm hiding but it IS the principle of it! Nothing is sacred anymore. What if a stalker was trying to find someone. Good move MyLife. You're as low as low can get. Publish THIS, creeps! Like Ancestry.com? Not hardly. They're helping people find dead ancestors which helps people feel good, hopefully about themselves. Dead people can't be hurt, sort of. I don't like their agenda. Sneaky. Horrible! So I went on this "mylife" site to see what this person had to say about me, as in email that was sent. I logged on and there was all MY information! Every site that wanted me, or I was at one time a member of and they displayed pictures of me with personal information. A little annoyed I gave them my credit card information to "delete" my personal information. Where I kept getting a screen saying I couldn't delete any information. So I went in and did the "cancel" within 7 days to stop the billing on my card. Got the confirmation letter in my email box and surprise on my statement. Showed 50 dollar charge! I called..they corrected..next month same thing. I called..they corrected. Finally I got someone who was understanding that stealing money from one's card wasn't a good business practice..a year later! Needless to say..scam!!! It's a bait and switch for sure! Just like Washington DC!! The TV networks even advertize them! Shame!!! Help me find an angel of a guy. Travelled on the same flight together, by chance. Vienna to London to Sydney via Singapore thats where he got off. Flight details Ba 15 Day 17 Oct Flight time-2135 pm Love to hear from and thank him for being so sweet. He will remeber me by silk red shirt I was wearing that evening. Mobile no-0412788735 still on iter -roaming. Email address- [email protected] Waiting Susan. This is one of the biggest SCAMS out there! Be careful when visiting this website!! 105 of 157 people found this review helpful. Marina and anyone else out there who is getting ready to do a search on someone this is one way that the sites you are about to use get information on people by when we fill out the information form we just gave them our information to give someone as you have found out. Before you pick a site to use read the terms and see if there is a check box where you can check to withhold your name and information from being given to a 3rd party you might find one if you are lucky but I don't think you will be that lucky. 7 of 18 people found this review helpful. 12 of 21 people found this review helpful. 46 of 101 people found this review helpful. FREE PEOPLE SEARCH! I LOVE FREE STUFF. When you say its free it should be. It should be free when you advertise free. 34 of 78 people found this review helpful. 120 of 255 people found this review helpful. 38 of 65 people found this review helpful. Terrible. I would have rated it with 0 stars, but that option was not available. I paid for 1 year's worth of the site, then attempted to cancel it immediately. 'Robert' told me I could not cancel it and was rude. Offered me a 6 month term instead, and I refused. I wanted to speak with his supervisor and he said none were available. I asked why? He told me "I does not know? He then told me he would check with someone else, and put me on hold to come back and offer me a one month term. I again refused. He then cancelled the order. Are these people for real? DO NOT purchase anything from them. I paid via Paypal and also cancelled the order myself. Goodluck! I am sick of reunion trying to sucker free info that they probably sell.....they use other names and say they are free....they are not! I feel really stupid reading the reviews after the fact. I actually got an emai in my junk mail from mylife with the info of someone I knew and in that moment of excitment, I made the mistake of paying a month and joining What a mistake! Customer service treats you as if you're stupid and the website does not allow you to delete your Credit card info or subscription. You actually have to call and explain that it is not a billing issue that you simply do not want a subscription or an account. Then you get attitude! WOW! This was a lesson learned. BAIT & SWITCH!! FALSE advertising. They advertised on TV all day that it was FREE today only. I decided to check it out. NO, it's NOT free today. Yes, you can enter a name and click Search. When the names come up, you can't get into without paying. It's a sham. Will NEVER join. 163 of 245 people found this review helpful. The old bait and switch, its not free. False advertising. Huge waste of time. They offer discounts and then refuse to activate them. It's the old bate and switch game. My rating of them would be -0. 210 of 335 people found this review helpful. False advertsing--- The search is free --but the actual viewing of the search is for a price. have no time for mind games. it is a waste of precious time. False advertising. The search for who is searching for you cost money. It is not free as advertised. This site is a complete rip off. The search is useless and it's not $1.99, they try to get you for $23.99. I called and got a "partial" refund, but still feel completely conned. DON"T, I repeat, DON"T join! Their subscription fee offers nothing you can't get for free. When your search finds a contact, there is an addition charge to see the results. Mylife is a rip-off (period). 148 of 252 people found this review helpful. I wish I had read these reviews before I wasted my time here. 109 of 170 people found this review helpful. SCAM.... nothing more nothing less. Just a Spam SCAM. I didn't give CC number But I still got spam from them. 38 of 63 people found this review helpful. I've never used Mylife.com, however I have fallen in the same trap as a lot of you. For anyone new to mylife.com who wants a review after a brief investigation of this site, here it is: AVOID THIS SITE AS IF IT WERE A PLAGUE!!! Mylife.com collects personal data from it's users hen sells it to a company called saving ace. Saving Ace is a fraudulent company that bills customers of background search websites like mylife.com and intellius. I have never used either of them. This scam is outrageous. Saving Ace claims to be in partnership with online retailers of different kinds and offering discounts to it's users who purchase through them. If any of you have given your information and credit card info to mylife.com, it's going to be only a matter of time before you can look on your bank statement and see charges billed to your account by Saveace and/or privacym. Right now I'm living on SSI following a foot infection I got while driving a truck cross country, these two fraudulent companies have wiped out my account, I had to borrow money so I could eat. I'M URGING ANYONE WHO HAS HAD THESE FRAUDULENT CHARGES BILLED TO THEIR ACCOUNT BY SAVEACE AND PRIVACYM TO CALL THE FEDERAL TRADE COMMISSION AT 1-877-FTC-HELP AND TELL THEM WHAT YOU KNOW ABOUT THIS COMPANY AND/OR WHAT THEY HAVE DONE TO YOU. IF ENOUGH OF YOU SHOW THE COMMISSION THAT THIS IS A PATTERN AND NOT SOME RANDOM SCAM, THEY WILL SHUT THEM DOWN AND WE WILL BE REFUNDED. IT WON'T HAPPEN OVERNIGHT BUT YOU WILL SEE RESULTS. 41 of 64 people found this review helpful. If you say "free" then make it truly free. there is $5 hidden charges. 79 of 178 people found this review helpful. mylife is part of web people search. same place. see my opion of them there. 220 of 391 people found this review helpful. 96 of 167 people found this review helpful. 100 of 133 people found this review helpful. 70 of 109 people found this review helpful. There is nothing free being provided here! Worst part is "if" you sign up for this service, you may be subjecting your credit card number to other vendors and not realize it until your bank statement arrives! 68 of 105 people found this review helpful. 34 of 84 people found this review helpful. 121 of 191 people found this review helpful. As with many others I would of done zero stars. After hearing about the site I decided to check it out to see what they have on me. Well they had alot. Like my old phone number, my siblings, ect....all information that I don't make public on the internetz. So I contacted customer service via e-mail and they have been giving me a run around how they find my information on public sites. I have asked them numerous times to provide the sites where they pulled my information. They never give the sites just keep stating that they get it off public sites. Well I googled my name, and found nothing. I did it again and added some key words about me, still nothing. This site is a sham and i hope it gets shut down asap. I have told them to get all my information out of their data base and keep it off. They have failed to do so. All people who come here, band together and get this false biz taken down. H1S1 - End of Report. Be sure to read sign up screen. The $9.95 a month is really for a year and you get hit for $119.40 at once. When you complain and ask for a refund the best you get is the difference between 1 year and 3 months. The 1 month offering ofn the original screen doesn't exist any more. What a bunch of crooks. This is ridiculous, nothing its free. Not worth it I wish I would of read the reviews first, but of course @ d moment it sounded good, u fall for it if u have some1 u been looking for, 4 ever!!! This is so pathetic, not true, SCAMMERS. Just want ur money. "Please don't do it"
If possible, I'd not give this site any stars at all... They go through a series of pages to get your name, age, email address and then want you to sign in. When you try to get the basic info they advertise, they say your email address is already on file and you have to sign in. When you try to get them to send you YOUR password, since they said you are already in their database, they say you will receive the ID and password in your email inbox. After hours of waiting, nothing! When I start getting email from this MyLife group, I will put them on block... This was advertised on Fox News Channel and I suspect others. A call to their advertising office should get this company banned as advertisers from those companies -- if they get enough calls about it. 78 of 102 people found this review helpful. what a big waste of ban bandwidth. 145 of 149 people found this review helpful. Has anyone contacted a lawyer? Take these clowns to court and rip them a new one! I got 5 bucks that says the CEO of this company wears a bow-tie and thick framed glasses with white tape on them, I'll punch him square in the face on pure principle. 153 of 289 people found this review helpful. 105 of 179 people found this review helpful. mylife is great for bad guys who want to invade your privacy. All they have to do is type in your name, age and zip code, and bingo! Mylife gives the bad guy your birthday, name of your spouse, name of your closest relatives. and prefix of your phone number. Doesn't take much to figure out the rest with the Internet these days. Thanks Mylife. Watch the crime rate go upppppppppp. 21 of 28 people found this review helpful. YES, YOUR FIND A FRIEND IS NOT FREE YOU JUST WANT MY CREDIT CARD AND YOU HAVE NOT REALLY FOUND THE PERSON I HAVE ASK FOR. WHEN I SEE PROOF OF WHAT I NEED THEN I WILL USE MY CREDIT CARD TILL THEN YOU ARE OUT OF LUCK... BE HONEST THAT WILL REALLY HELP YOUR BUSINESS..
32 of 33 people found this review helpful. 40 of 58 people found this review helpful. 2 of 19 people found this review helpful. 125 of 198 people found this review helpful. You create an account, do a search & can't get the info you need. Then they email you a ransom notices that they�? ?re holding your search results hostage and want you to pay to see them. Not only that, they have published my personal address, family members�?? names, etc. I�? ?m sick of these morons on the internet doing whatever they want just because they can! They have no morals at all. these MFs that go by the name of mylife.com need to be shut down ASAP. 151 of 253 people found this review helpful. your site is not FREE. that's false advertising!!! 14 of 18 people found this review helpful. 23 of 26 people found this review helpful. 19 of 23 people found this review helpful. I read their ad, and got ZILCH for my money. The info you get from their site is all free. Whoever you are looking up has to have a profile filled out WITH THEM in order to exist. DON'T WASTE YOUR MONEY. The site is absolutely ridiculous! Oh yeah it is SO free that is why when I supposedly found who I was looking for they wanted my money. Would give -5 stars if U could. Nowhere does it say you can "find" people in USA only - finding in Europe and elsewhere, out of luck, even in this small world age - and no refunds. Big scam. nothing free here.just a money grab.no thanks.not very honest of this web site. 110 of 220 people found this review helpful. You are not free like you say.So,therfore you are decieving people. 0 stars. They lie about using Trust-e to monitor privacy. They also won't delete your info if you tell them you don't want to be on their site. Totally crooked and exploiting personal info.